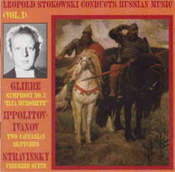 Reinhold Moritzovich Gliere : Symphony n�in B Minor, op. 42 "Ilya Mourometz"
Mikhail Ippolitov-Ivanov : Caucasian Sketches n� op. 10/2 "In the Village"